Though it is still winter, this past week brought some activity to the garden. My aspirations as a wildlife gardener took another step. 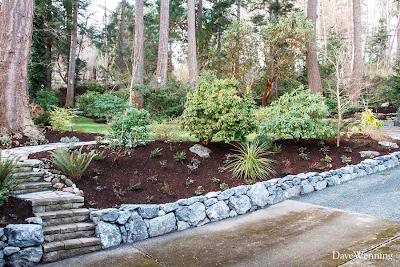 The perennial garden next to the driveway has been replaced by a new bed of native plants. The old rockery which had been built from on-site stones was removed and replaced with a new stone wall. The perennials which grew here have been moved to the beds in the front yard. I believe this new native plant garden will be a more appropriate asset for attracting wildlife. The sun came up yesterday under clear skies on South Fidalgo Island. Since I was going to be downtown, I decided to take the camera to get some shots from the top of Cap Sante. This is a hook-shaped peninsula at the northeast corner of Fidalgo Island adjacent to downtown Anacortes. There are wonderful views from the top. 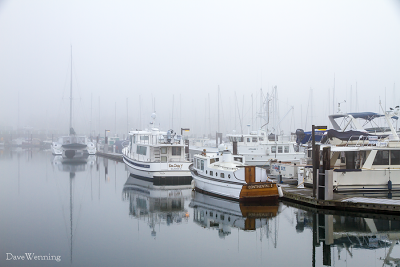 As luck would have it, Anacortes and the north end of the island were socked in with fog. The only sight from the top of Cap Sante was a dense haze. OK then, what now? I decided to go down to the Cap Sante Boat Haven nearby. I enjoy looking at the boats and also taking photos that portray the weather. I did this once before, but I have a better camera now and my post-processing skills may have improved a little.